The coqui frog may be small, but it has a big voice. This invasive 'stranger in paradise' is causing trouble. HONOLULU (AP) — The coqui is a tiny, coin-sized frog whose distinctive nightly mating calls are a beloved sound in Puerto Rico and other Caribbean islands. But people in Hawaii don't share the same sentiment. The frogs have been growing in population in the state in recent years and are now starting to show up in larger numbers on Oahu — home to most of the state's population. The frogs already have a strong foothold on the less-populated Big Island, and people there complain of being kept awake at night with a thunderous roar of chirps as thousands of male coqui simultaneously summon partners — a mating chorus some say can be as loud as a jet airplane. The frogs are also preventing the state's plant nurseries from exporting to some markets, and depressing some Big Island property values. The frogs aren't stopping tourists from visiting, but there's a fear they could if they spread further. There have been just as many reports of coqui on Oahu in 2011 as the seven prior years combined, said Derek Arakaki, who helps hunt coqui frogs for the state Department of Agriculture. Before, Arakaki and two others on the coqui-eradication team would head out to capture the frogs on Oahu once a month or maybe twice a month. This year, there have been times when they've had to go coqui hunting twice a week. The frogs are a significant problem in their non-native Hawaii because the state has no natural predators to stop their advance. As a result, they have spread quickly through the lush forests and yards near Hilo since they were accidentally introduced to the Big Island in the 1990s. They have been making a steady advance into the more heavily populated Oahu in recent years, sneaking onto the island on plants and stowing away in cars, piles of lumber, cargo pallets and whatever else that's being sent to Honolulu. "Compared to the amount that's on the Big Island, very few are actually getting through," said Carol Okada, an Agriculture Department plant quarantine manager who heads the state's efforts to control invasive species. "But the amount that's getting through is still enough to establish a population, so we are still very concerned." 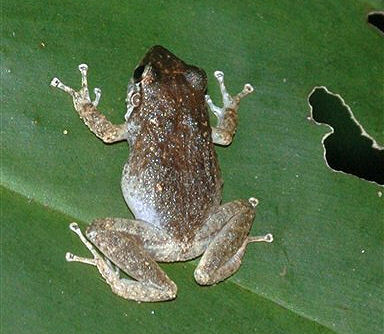 Coqui, which get their name because of their "ko-kee" chirps, are showing up in diverse places. The International Marketplace outdoor bazaar in the heart of Waikiki, the state's tourist mecca. Near a banyan tree in front of a multiplex theater. Seven coqui were found in a home in the upscale Diamond Head neighborhood. The residents had brought back some plants from the Big Island not knowing they needed to be inspected for coqui before shipping them to Oahu. Coqui eradication team members spot them by mimicking their mating call, which prompts the frogs to call back. They hone in on the sound and trap the frogs with a clear tube. Sometimes, they'll spray water to entice the frog to sing. In a few cases, the coqui team has found so many frogs they've had to kill them with citric acid, the preferred chemical for eradicating the frogs. That was the case in the rural windward Oahu town of Hauula, where coqui had spread out across several homes and a city park. Residents there heard nocturnal chirping, but didn't call the state's pest control hotline because they thought birds were making the sounds. By the time the authorities were notified, the frogs had been around and breeding for two years. It took the crew several months to get rid of the infestation. The problem is only made worse by recession-induced budget cuts that forced the state to slash the number cargo inspectors to 50 from 95. This caused the Agriculture Department to prioritize checking out-of-state cargo, because imports are more likely to carry harmful species like snakes — an animal that hasn't become established in Hawaii. Okada said the state will have to capture more pests that get through because there haven't been enough people to spot them at the ports. "When you're not at the front end, you end up chasing it on the back end," Okada said. The state has had this problem with snakes, which could wipe out Hawaii's native endangered bird species they ever became established here. A dozen — from boa constrictors to ball pythons — have been either captured or turned in to authorities since July. "There's a reason why all the snakes are coming out this year. We're not out in force anymore," Okada said. Gov. Neil Abercrombie enabled the state to hire 10 more people to bring the inspector count close to 60, but Okada said they're still far short of where they need to be to effectively intercept pests entering Hawaii or traveling inter-island. Okada said one scary thing about this past year was that many coqui were found closer to the base of Oahu's heavily forested mountains. The coqui population could explode if they started breeding somewhere like the back part of Manoa valley, where it frequently rains. Authorities are asking the public to call the state's pest control hotline if they think they hear a coqui.